They provide the opportunity to learn and advance my knowledge, so I can grow my career and perform better in my job. However, as much as I’d love to attend 20 marketing conferences a year, there’s only so much time and money to go around. This is why webinars are so beneficial. Let’s start by looking at the definition of what a webinar is. A webinar is a live, virtual event that is executed online. It is an educational or instructive session that includes audio and visual communication between a speaker and attendees. Webinar software enables the sharing of slides and interactive participation through chat boxes and Q&A features. Webinars give you the opportunity to learn, as you would at an in-person event, with added advantages we’ll discuss in a moment. The word webinar comes from “online seminar” or “web-based seminar”. Most companies execute an event marketing strategy that involves face-to-face interaction. Event organizers book a venue, and attendees have to physically get themselves to that location. As you can see, webinar software enables the host to provide a virtual connection to attendees in the comfort of their own home or office. The goal of webinars is to educate, demonstrate, or instruct. While both B2C and B2B companies can use webinars in their marketing activities, it is a tactic most commonly used in B2B marketing. 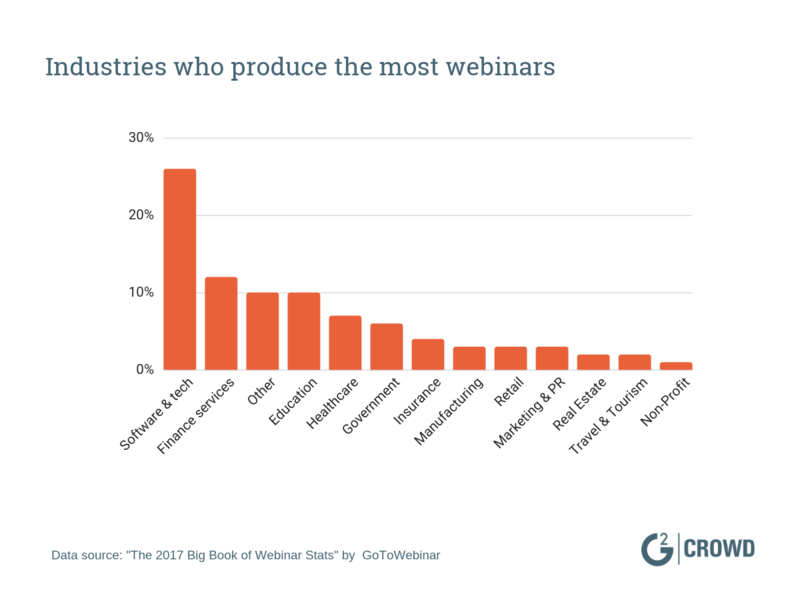 Wondering what companies produce webinars? GoToWebinar analyzed 350,890 webinars to create The 2017 Big Book of Webinar Stats. In it, they found the industry producing the most webinars was software and technology, at 26 percent. Industries producing the least amount of webinars were travel and tourism, at 2%, and non-profits, at 1%. In addition to businesses, universities and other educational institutions will organize webinars for their students. This provides a low-cost way to share information with a large number of students. It’s especially handy if there’s a speaker who is influential; colleges can find themselves with too many attendees for one lecture hall! You may watch an educational video on the internet, but this doesn’t mean it’s a webinar. Just like any other event, a webinar has a predetermined time and date. Many companies make their video available on-demand after the event. The day after the webinar occurs, organizers will send all registrants a link to watch the webinar. This enables people the ability to watch it at their leisure; no one misses the opportunity to learn. However, there still has to be a time when the live streaming occurs; this is what makes a webinar an event, rather than just a video. Hosting a live event with a set time and date is what enables the next two webinar elements: online attendees with live participation. This is another trait webinars share with live events; you can’t have an event with no attendees! Since webinars can be viewed on demand, you don’t need as many attendees, but you do need some. GoToMeeting cites 66% of webinars as having under 50 live attendees. In order to increase attendance, companies put heavy consideration into what time and day they host their attendees. Without attendees, webinar creators can’t execute the next requirement: attendee participation. Webinars always have a way for attendees to participate in the event. The interaction can take multiple forms; the capabilities depend on the type of webinar software being used. Whether I’ve been the organizer, speaker or attendee, every webinar I’ve seen has time for Q&A. It’s rare to have a webinar without questions from the audience. Many webinars have live chats. Sometimes this is how questions are submitted; the chat is private, and only the webinar host can see the questions. Other times, the chat feature is live. All attendees can see comments in the chat box and respond to each other. Another fun interactive element of webinars is the use of surveys and polls. The host has predetermined questions, and attendees are given a couple minutes to respond with their answer. The results are then immediately shared on screen. In order to share the results so quickly, webinar survey questions are not open-ended. Rather, they are multiple choice or likert-scale (ranking) questions. These interactive elements are why it’s better to attend the webinar while it is live. Yes, you can watch it on-demand at a later date. But participating live means you can ask the speaker your question, participate in polls, or interact with other attendees. In order to educate webinar attendees, you need a speaker who has authority on the topic. And, the definition of a webinar means this will be done through a live-streamed video. Many times you’ll see a live-streamed video of the speaker as they present. Even if you don’t, you can bet the next visual element, slides, will still be present. I have never been to a webinar without slides. It’s very rare to attend an educational corporate event that doesn’t have slides. Only the best, most charismatic event speakers can pull off an engaging presentation with no visual aids. If slides are crucial for live events, they become even more imperative in the virtual conference room of webinars; participants don’t feel the same energy they do in face-to-face events. This is why every webinar has slides. 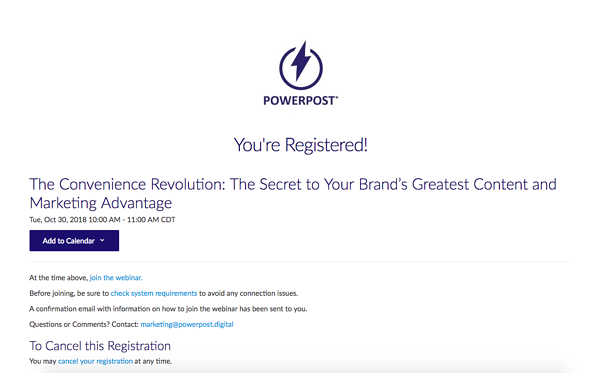 PowerPost is an enterprise publishing platform that focuses on owned media. In this article, we’ll look at a few examples of their successful marketing masterclass webinar series. In addition to visuals assisting the learning process, slides help keep participants focused on the event. It’s much easier to get distracted when surrounded by chatty co-workers! Webinar slides are created using presentation software such as PowerPoint, Prezi, or Google Slides, and are often heavily branded. Along with the visual elements of a webinar, it makes sense that participants also want to hear what is being said. This is why webinar hosts and speakers are required to have a microphone. Some people simply use their computer; others who are heavily invested in this tactic will invest in more high-tech equipment. In order to combine and execute all of these elements, you need webinar software. This software is the glue that holds everything together, enabling you to have an interactive event with attendees from anywhere. 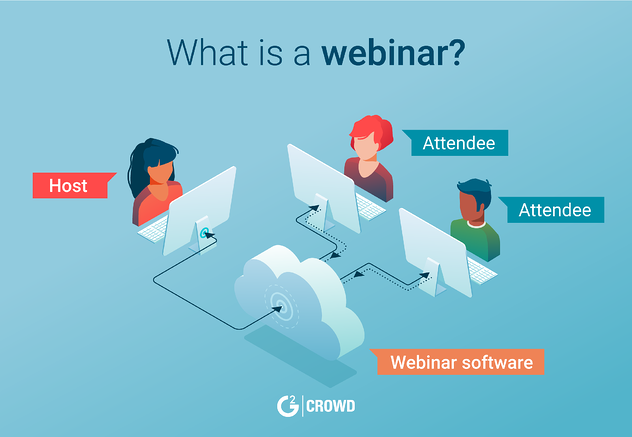 For companies wanting to create webinars but lacking big budgets, they can maximize this event opportunity through free webinar software. The capabilities will vary between webinar software. Not everyone will need all of the features a provider has to offer. How long does a webinar go for? In addition to the above elements, webinars should run for a minimum length of time. According to ON24 and their 2018 Webinar Benchmarks Report, the average webinar viewing time in 2018 was 56.4 minutes, illustrating how most webinars run for an hour. The event can, however, be shorter. BigMarker cites the ideal webinar length as 30 to 45 minutes long, with 41% of people choosing a 30-minute webinar, and 44% preferring a 45-minute webinar. 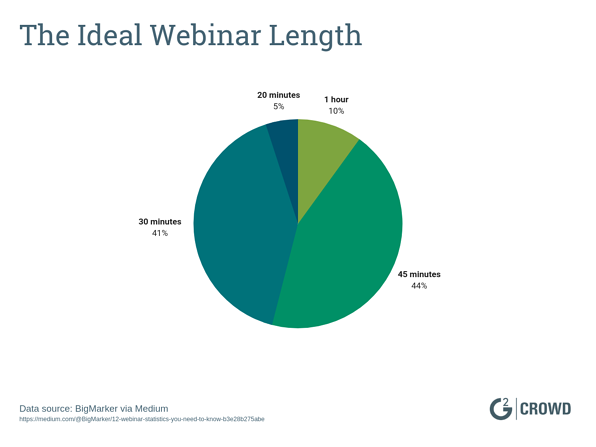 According to BigMarker’s data, 5% of people want a 20-minute webinar. However, if a webinar is this short, there’s a good chance the content is not going in-depth enough. If the webinar is not educating the audience, it’s losing the entire purpose! You will receive an email or be directed to a landing page with a link to register for the webinar. After you complete the form with your details, you will be see a “thank you for registering” page confirming your registration. After you enter your details, a confirmation email will be sent to you; this will have a link to register for the webinar. It may also include any software you are required to download. Sometimes, the confirmation email will give you the ability to add the event to your calendar with the click of a button. 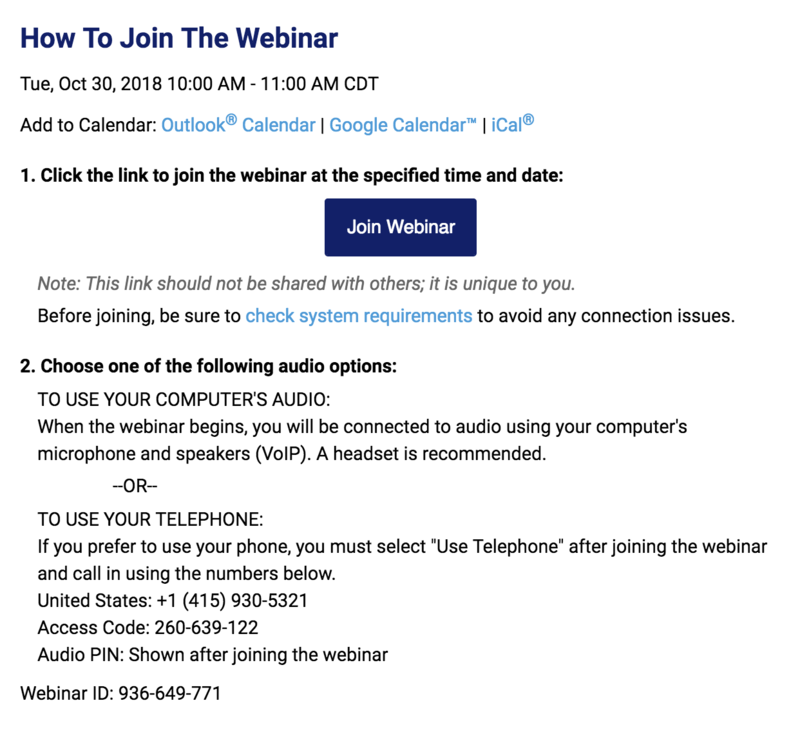 Here is a portion of a PowerPost webinar confirmation email; as you can see, there are detailed instructions on how to join the webinar; as well as the ability for participants to add the event to their calendar. You will often receive an email reminder with the webinar link; these are usually sent the day before or day of the event. If needed, download any software required. The registration confirmation email should alert you to anything you need, or give you the ability to test your computer. For you to execute all of the above steps, there are a few things you’ll need. Thankfully, I’m willing to bet you have them all on hand! If you do need to download any required software, don’t worry – it will be free! Given webinars usually come without a registration fee, no one will make you pay for software. This image shows a registration confirmation email I received from the Content Marketing Institute (CMI). As you can see, they have a “system test” section, where attendees can make sure they have the ability to join the webinar on the day. And, if you want to participate in the webinar when it’s live, don’t forget to put it on your calendar! As we went through the elements of a webinar, several benefits may have stood out to you. Let's take a look at each of these six webinar benefits. We’ve already covered that webinars are educational. When I attend a well-executed webinar, I’m learning new ways to execute my job with more efficiency and better outcomes. That alone is a reason to tune in! In addition, webinars are a low-risk form of education. There’s truth in the statement that “time is money.” I don’t want to waste my time (or money, for that matter!) attending an event that isn’t relevant for me. 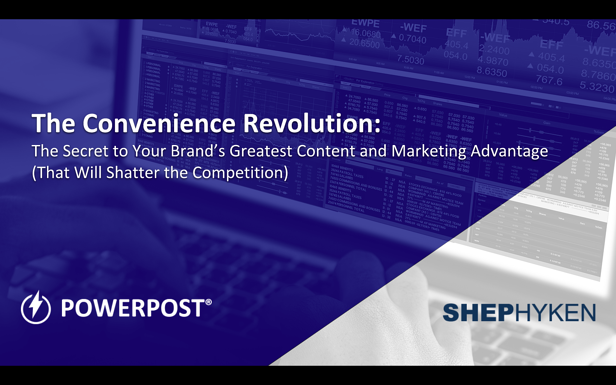 If I sign up for a webinar, and the content doesn’t match my needs, I don’t feel the need to sit through the rest of the event; I simply close that window on my computer. Webinars also help me increase productivity while learning. When I join a webinar from my office, I’ll have one window open for work, and another open for the webinar. Imagine I only need to learn 20% of the event content; the rest I’m familiar with. With one webinar window open, I can be ready to listen when it’s relevant, while not falling behind on other time management priorities. 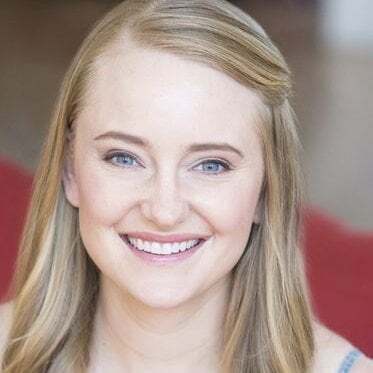 Companies who host webinars can use this educational element as a way to help customers and increase brand awareness, especially when they have a well-known speaker. One of the biggest benefits of webinars is the ability to watch on-demand. This is a feature many webinar platforms provide. If I have deadlines or other commitments conflicting with a webinar I want to attend, I still always register. Even if it’s not stated in the promotional materials, I know there’s a good chance they’ll send me a link to watch the webinar when my schedule allows. Notice how the email also mentions that the transcript will be added online. The ability to share webinar transcripts is another benefit; attendees can scan through the text looking for the content they find most relevant. If there is a webinar you want to watch on-demand, schedule a time on your calendar. You need to include this when you prioritize your week; otherwise you’ll find other urgencies taking over. The on-demand webinar feature ties into the next benefit: access from anywhere in the world. I mentioned that I don’t want to spend my time watching a webinar that doesn’t help me. Remote access frees up even more time; I also save time traveling to and from the event. Living in Chicago, there’s a good time that will give me an extra hour (or more!) to get my work done. In addition to time, it saves you and your company the cost of parking or your Uber ride to and from the event. Plus, as long as it meets all technical requirements, webinars can be watched on any device, including laptops, tablets, and phones. Depending on the webinar platform, you may need to download an app for phones and tablets. Thanks to the on-demand benefit of webinars, the advantage of remote access applies to customers in different time zones, too. Even within the United States, a 2:00 PM webinar in California will be 5:00 PM in New York; right when people are leaving the office. Thankfully, with the ability to watch on-demand, I can live in Chicago and still watch a webinar that was executed in Australia. This access is also a benefit for people creating and promoting a webinar; you can share your content with customers wherever they may be. It’s not just travel costs you’re saving when it comes to webinars. Many of them are also free! If you want to spend money on career-development, and you want your company to pay for it, your first step is getting your manager to approve it. Webinars remove this barrier; when I see a webinar I want to attend, I can register immediately, rather than writing my manager an email. Some companies will charge a nominal fee for their webinar; this is a way to encourage attendance on the webinar day. However, when webinars are conducted as a marketing strategy, that fee can be seen as a barrier. Which is great for attendees – this is how we’re able to attend them for free! Free webinar software also gives companies the ability to try out a webinar tactic with minimal cost. Using surveys and polls keeps attendees interested. When I’m asked a question in a webinar, I eagerly wait to see the results, wondering how I compare with my peers. But this feature of webinar platforms gives you another benefit: You’re creating content! And not just that, you’re creating content that’s backed by data. Using original research in content is one one of the best ways to get results; nine out of 10 companies find it to be successful. Getting people to take your survey, however, can be tricky. Alternatively, in a webinar, you have an audience ready and waiting for the opportunity to participate in your poll. Hopefully you have enough webinar participants to make the data valid. If that’s the case, keep a record of all data you’ve compiled through webinar polls and surveys. Even if you ask three questions over the course of an hour, you’ll find yourself with data to create visuals and tell a story. Then, use this data to create blog posts, infographics, or even social media images that promote viewing the webinar on-demand. Let’s not forget that webinars serve a purpose for both the host and participants. As we’ve discussed, most industries educate their prospects and customers. This enables attendees to perform better in their role, providing a benefit to their company. On the other side, for companies hosting webinars, there are also extensive benefits. 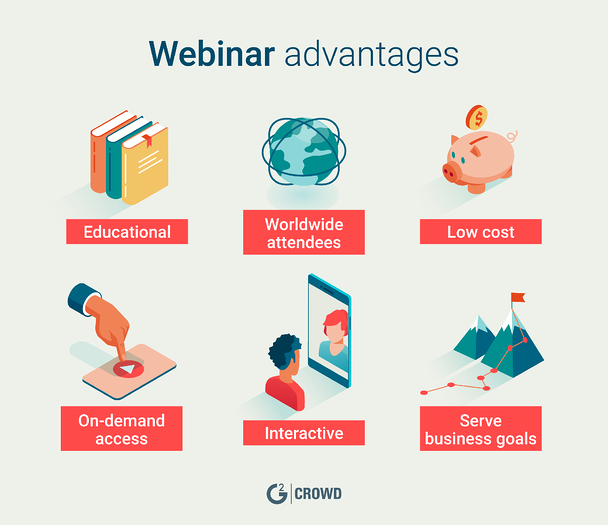 We’ve covered that webinars increase brand awareness, and businesses can reach customers and prospects around the world. Webinars are also a part of demand generation; when people register, you can include them in your marketing funnel and lead scoring. The ability to track attendance enables you to see who is regularly engaging with your brand. Utilizing webinars also gives you another reason to interact with customers. For example, if you are a software as a service (SaaS) company, you will have product updates. When you’ve made improvements to your software, by all means use email marketing to let your customers know. However, there’s a good chance the email will get missed in that crowded inbox. Hosting a webinar gives you another reason to let customers know you’ve improved the product. Instead of promoting just your product, you can also promote the webinar! With an understanding of how webinars work and why they are so beneficial, it’s time for you to join your peers and start participating! Are there any companies you see as a regular resource? Sign up for their email newsletters and follow them on Twitter and LinkedIn. This way you won’t miss out when they conduct their next (or first!) webinar. Look to your industry influencers and follow them on social media, too. You never know the next time they will be a webinar speaker, and they’re sure to let their followers know. Then, when the webinar day comes, log in and let the learning beginning! Got any webinars you love? Let me know on Twitter, @AusmericanGirl and I’ll give you and your webinar a shout-out!